Neil Young didn't didn't show up for his Olympic tribute in Vancouver on Thursday night, but the more than two dozen artists who took the stage captured his spirit closely enough with a show that was heartfelt, stirring and delightfully rambling. Neil Young, seen here in 2009, wasn't at the tribute in Vancouver on Thursday, but Lou Reed, Elvis Costello, Eric Mingus and Emily Haines were among the artists to honour him. 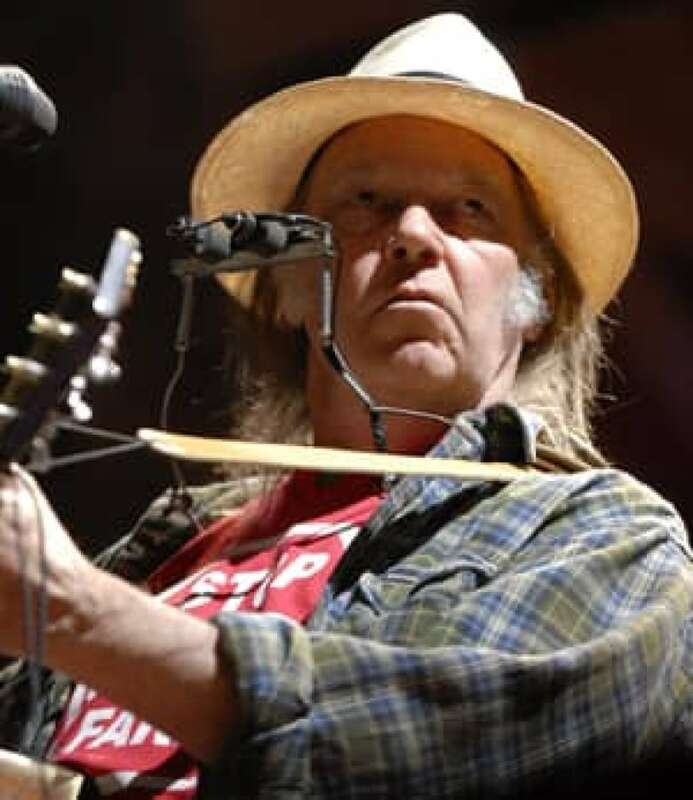 Neil Young didn't show up for his Olympic tribute in Vancouver on Thursday night, but the more than two dozen artists who took the stage captured his spirit closely enough with a show that was heartfelt, stirring and delightfully rambling. Lou Reed, Elvis Costello and Ron Sexsmith were among the performers who took the stage at a packed Queen Elizabeth Theatre to play songs drawn from Young's expansive catalogue in Hal Willner's Neil Young Project, a part of the Cultural Olympiad. Much of the three-and-a-half hour set list focused on more obscure Young tunes. Renditions ranged from studiously faithful to almost unrecognizable in the show, which was scheduled for a second performance on Friday. Reed, clad in all black with a demeanour that could only be described as all business, hammered his guitar through a performance of Helpless before accompanying vocalist Jenni Muldaur on a rendition of Harvest. Costello brought a finger to his lips to hush the cheering crowd before crooning a version of Love in Mind (culled from Young's 1973 live record, Time Fades Away) then, later, whipped the same crowd into a frenzy with strutting renditions of Cowgirl in the Sand and Cinnamon Girl. When the latter inspired a standing ovation, Costello — one of the evening's most energetic showmen — doffed his spotted fedora. Where Reed and Costello sang Young's songs in their own inimitable styles, a few of the evening's other performers opted to hew more closely to the originals. Broken Social Scene's Brendan Canning, Sam Goldberg and Bill Priddle each channelled Young's high-pitched voice as they performed. And a section of the show just prior to the intermission seemed to sag as a series of artists attempted faithful versions of Young's early-career ballads. But the evening's highlights were borne from riskier renditions of Young's tunes. Eric Mingus — the son of jazz legend Charles Mingus — brought the house down with a spare, insistently urgent take on For the Turnstiles (from 1974's On the Beach.) Accompanied by bass, drums, handclaps and, eventually, saxophone, Mingus bellowed and shook while he sang. The next time he was set to arrive onstage to chant the lyrics to On the Way Home, the crowd cheered appreciatively at the mention of his name. Meanwhile, avant-garde blues guitarist James Blood Ulmer's searing version of Scenery was almost unrecognizable. The 68-year-old tossed up the devil horns as he ambled offstage to an ovation from the crowd. The entire evening, in fact, had a likably ramshackle feel to it. Willner — an American producer and the music supervisor on NBC's Saturday Night Live since 1981 — didn't tell the artists which songs he wanted them to perform until the days leading up to the show. As a result, many had to read music and lyrics as they played. Oddly, there wasn't much by way of banter between the performers and the audience. When singer-songwriter Julie Doiron acknowledged Young specifically toward the end of the show — the first time anyone had done so — she almost acted as though she were speaking out of turn. "I know we all grew up listening to Neil Young," the Sackville, N.B., native announced. "It's been a thrill and an honour to be here." If the musicians onstage seemed to be enjoying themselves, so did the enthusiastic fans. Each time Reed took the stage, the audience united in chants of "Loooooooou." (Reed acknowledged them once, holding his guitar up in salute.) And just prior to Emily Haines's gorgeous version of A Man Needs a Maid, an overeager spectator shouted "Whoa, mama!" as the slim blond singer walked onstage. The obscure set list didn't seem to dampen their spirits in the slightest — and some diehard Young fans in the crowd even said they appreciated it. "I'd rather see that than all the hits," said Mark Hamilton, who had just arrived after flying out from his home in Guelph, Ont. "I'd be really happy if they played something off of Trans," contributed Paul Dickson of Vancouver before the show, referring to Young's vocoder-heavy 1982 experimental album. Performers made a few efforts to engage the audience, too. During a performance of Walk On, Jason Collett marvelled at how well-behaved the crowd had been ("It's very Canadian of you," he said) before asking them to follow along through some audience "participaction," which involved fingers snapping and hands clapping against thighs. Fans had hoped Young would be at the concert, but he was never part of the bill. But ultimately, hours of listening to his songs was enough for most of them. "I love it," said Tim Harris of Vancouver. "I'm singing along to all of it. I listen to a lot of Neil." Organizers had hoped Young would be at the concert but he was never part of the bill.